Pundit Iswar Chandra Vidyasagar was born in the village of Beersingh, not far from Kamarpukur, Sri Ramakrishna's birthplace. He was known as a great scholar, educator, writer, and philanthropist. One of the creators of modern Bengali, he was also well versed in Sanskrit grammar and poetry. His generosity made his name a household word with his countrymen, most of his income being given in charity to widows, orphans, indigent students, and other needy people. Nor was his compassion limited to human beings: he stopped drinking milk for years so that the calves should not be deprived of it, and he would not drive in a carriage for fear of causing discomfort to the horses. He was a man of indomitable spirit, which he showed when he gave up the lucrative position of principal of the Sanskrit College of Calcutta because of a disagreement with the authorities. His affection for his mother was especially deep. One day, in the absence of a ferryboat, he swam a raging river at the risk of his life to fulfil her wish that he should be present at his brother's wedding. His whole life was one of utter simplicity. 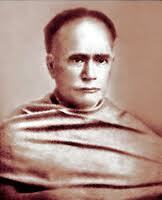 The title Vidyasagar, meaning "Ocean of Learning", was given him in recognition of his vast erudition. The carriage stopped in front of. Vidyasagar's house. The Master alighted, supported by M., who then led the way. In the courtyard were many flowering plants. As the Master walked to the house he said to M., like a child, pointing to his shirt-button: "My shirt is unbuttoned. Will that offend Vidyasagar?" "Oh, no!" said M. "Don't be anxious about it. Nothing about you will be offensive. You don't have to button your shirt." He accepted the assurance simply, like a child. The pundit became silent. Sri Ramakrishna said: "Your activities are inspired by sattva. Though they are rajasic, they are influenced by sattva. Compassion springs from sattva. Though work for the good of others belongs to rajas, yet this rajas has sattva for its basis, and is not harmful. Suka and other sages cherished compassion in their minds to give people religious instruction, to teach them about God. You are distributing food and learning. That is good too. If these activities are done in a selfless spirit they lead to God. But most people work for fame or to acquire merit. Their activities are not selfless. Besides, you are already a siddha."